Thursday is usually the day I start thinking about the weekend; mostly about what I’m gonna eat, how I’m gonna make it and what ingredients I’ll need to procure. You see, I don’t cook according to what’s in my fridge – I cook according to what’s in my mind and I fill the fridge with those things. Often, I do this on a case by case – day by day basis; Sometimes that fridge is emptier than a foodie’s wallet at Whole Foods. You see I live by the fickle law of cravings. If I’m craving something – I’m gonna eat it. I’ll go shopping at multiple stores just to get that one thing – I don’t care how far or how inconvenient – I’ll make it happen. Some might say I’m obsessive or I’m too visceral when it comes to food. YO! I just wanna EAT! So today’s recipe is mad simple – I feel like I’m sorta cheating with this recipe (not only because of the simplicity of it but also because I’m essentially making what I’ve made before but switching things up a bit) but as you know – cravings take precedence over er’thang. So what do I crave the most? Breakfast! I’ve been a mushroom fiend as of late. It’s showed up to more of my dinners than pesky neighbors do on bad CBS sitcoms – so it had to make an appearance here today! Queue up my favorite breakfast staple, Tofuevos. 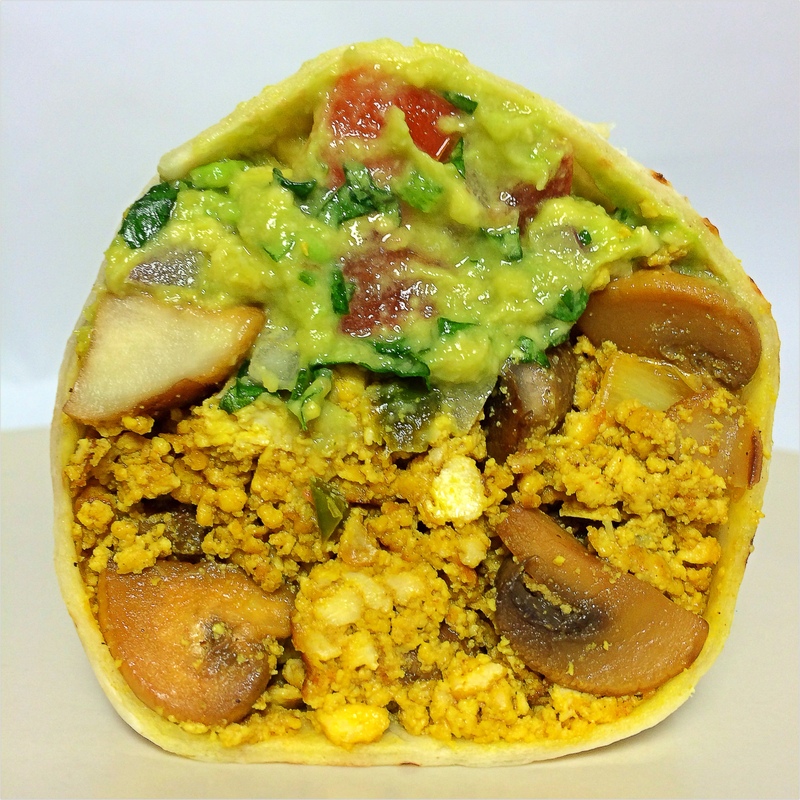 (Something I make more than I care to admit) – add in the worlds most amazing ingredient – Avocado (in it’s most colorful form mind you – Guacamole) – wrap that all up in a tortilla and ladies and gents you have yourself Magic! The key to this burrito is to cook the (main) ingredients separately first then finish off cooking them (all together) off at the end. Mushrooms release a bunch of their natural (water) moisture and can throw off the dish. Plus, the key to seasoning mushroom is to do it after they have cooked through a bit – otherwise they essentially stew in their own juices and the flavor won’t be as profound. The same pretty much goes for the peppers and onions in this dish so I do that separately as well. 1. Heat 1 tsp oil in a large saute / frying pan over medium high heat. 3. Sprinkle mushrooms with nutritional yeast, garlic powder, black pepper and paprika – stir. 4. Add your soy sauce and water. Stir. Cook until all the liquid has evaporated. 6. Add 1 tsp canola oil to pan; add your peppers and onions. Stir to cover in the oil. 8. Remove from pan – add to your mushroom mixture. 9. Turn pan off.From here: I take a slightly damp clean towel (or paper towels) and clean up whatever was left behind by both the onions and mushrooms. You don’t have to get it spotless but you will want the pan free of (too much) residue. Alternatively you could just use a new pan.10. Heat remaining tsp of oil over medium high heat. Add your tofu mixture and stir around to lay the tofu mixture flat. 11. Cook for about 4 minutes, stirring intermittently. 12. Add your (cooked) mushrooms, peppers and onions (that you had previously set aside) and cook for another few minutes. 13. Serve in warm flour tortillas with Guacamole. Boom!